More than 22,000 visitors jumped on board a life-sized mock-up of an Edinburgh Tram in its first week on display in the city's Princes Street. Tram organisers claimed that a poll of visitors to the tram found 80% gave positive feedback. The tram was placed on Edinburgh's main thoroughfare 10 days ago to coincide with the start of work to lay tracks. However, work did not begin due to a dispute between project managers Tie and construction firm Bilfinger Berger. Transport Initiative Edinburgh (Tie) accused the contractors of imposing new conditions that could add £80m to the cost of the £500m project. The contractors said they needed guarantees on "additional costs". Leading Spanish company CAF is building 27 tram vehicles for the Edinburgh project. They are best known in the UK for the Heathrow Express and recently supplied trams to Seville. 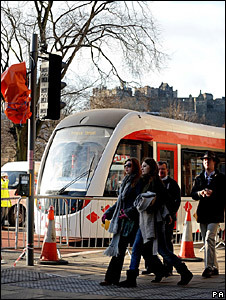 At more than 40m long, Edinburgh's trams will be the biggest in the UK and carry up to 250 passengers at a time. Jenny Dawe, Edinburgh City Council leader, said: "It is extremely encouraging to see so many visitors flooding through the doors of the mock-up. "I visited it myself last week and was very encouraged to see that people are taking such an interest. "The feedback from the public has been very positive so far and the staff on the tram are doing a great job educating visitors on Edinburgh's new integrated, environmentally friendly transport system, which we will deliver in 2011." David Mackay, Tie chairman, said: "When we commenced the procurement of these vehicles, we promised Edinburgh citizens that we would get them the best. "This mock up of tram demonstrates the results of that commitment and is one of the first tangible signs of the Edinburgh Tram Project. "There is now a real sense of excitement among the thousands of people who have come to have a look. "I would urge as many people as possible to have a look over the next several weeks."